Finishing a beloved series is difficult. I'm more of a realist in the sense that everything needs to end eventually. You can make a series 10+ books if you want, but you need to stop at some point. 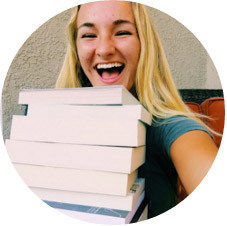 Rachel at Beauty and the Bookshelf had a fantastic discussion about the continuation of a series, and she ended it by asking if we were the kind of reader who would never want a series to end. I realized I wasn't, and said that the quality of the story would lesson as time went on. There's magic in the story because it has a cause. Whether that be from overthrowing a totalitarian government or stopping an evil villain (if we're talking fantasy here), or overcoming the death of a family member or getting into the college of your dreams, we're hooked by this quest. If we care about the characters, we want to see them overcome whatever obstacle that stands in their way. We care, sometimes too much. So, for me, even though it physically hurts to finish a series, especially one that has hooked me in and sunk its claws deep, I'm also happy it's ending. It deserves a good ending. So, like I said earlier, finishing a beloved series is difficult. As some of you may or may not know, I listen to music when I read. I made a post about it, with some examples of my favorite books and their corresponding music. To sum it up: I pick my song based primarily on sound, not by the lyrics. It has to fit the mood of the book. If it doesn't, it's like nails on a chalkboard for me. Finding that perfect song enhances my reading experience tenfold, and I honestly can't imagine not listening to anything while I read. Plus, I have a slight case of ADD, so listening to music blocks out any distractions so I can focus more on the story. I'm not sure if this happens with everyone or not, but playing a song repeatedly while reading a book almost, I don't know, glues the song to the story. You know how shows have theme songs? Take I'll Be There For You, the Friends theme song. You can't play it without thinking of Friends. Every vocal chord, sound, and instrument is ingrained in that show. If you hear a similar note in a different song, you think of it. That's how it is for me. If one of my theme songs comes on, for a split second, I'm ripped away from whatever I'm doing and thrown into a kaleidoscope of that book. Characters, scenes, and feelings come rushing at me. Then it pulls back, like the tide, and I'm back to reality, but it's resting in the back of my head, always sitting next to me and reminding me of the book or series. So, not only do I mourn the ending of this series and its character's and their struggles, but I'm mourning the feelings. I'm mourning that kaleidoscope, because it'll never be as strong as it is when I finish a book. I'm 100% immersed in the story and the music, which creates this entity that I really have no words for. It's like the finishing notes at a play; you realize it's ending as the music is being drawn out, and you're simultaneously trying to fit every sound and smell and feeling into your memory, while thinking to yourself "This is it, this is it, this is it." 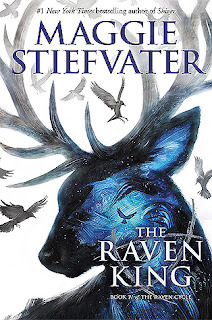 Which leads me this: my review of The Raven King by Maggie Stiefvater. I wasn't exactly sure how I was going to construct this post. I knew I wanted to write a little something before, since this is an anticipated final book in a series, but since I wrote so much, I decided to write this review in two parts. The first will be a very short overall summary of my feelings. The second will feature some of my concerns, which will obviously contain spoilers. So, let's get into it! I thought The Raven King was a fantastic ending, especially for its characters, which isn't very surprising since this is a character driven story. I do have a couple concerns and a slight disappointment for how a certain quest in this story ended, but it was overshadowed by the overall feeling of rightness. Steivfater's writing was even more amazing, which I didn't think was possible. If you've read the rest of these series, but for some reason have yet to read this, READ IT. Please. Okay, to try and keep this entire post as short as possible, I'm just going to talk quickly about the few things that either confused me or disappointed me. Firstly, the anti-climactic scene of finding Glendower. WHAT. WAS. THAT? Was Steifvater trying to shock us? Throw us for a loop? Because I was just disappointed. The gang goes through so much to find this damn king, and yet, he's just dead. "Whoops, I wrote an entire serious where one of the main plot points was finding a sleeping Welsh King that one of my characters spent years of his life pursuing, but I'm just going to crush everyone's dreams and waste everyone's time and have him be dead this entire time. Yeah! Sounds good to me." Then we have Noah, who supposedly masterminded this whole Welsh King charade, who's life is constantly in this circular motion, time traveling, very-confusing whirlpool thing. I don't know about anyone else, but time-traveling is very confusing on a good day for me. If it's just thrown in my face very quickly, I might as well be bashing my head against the wall. (And by this time traveling thing, I mean Steifvater spewing out that "Gansey felt like time was slipping away, as if he had already done this" sort of thing. That wasn't the exact sentence, but it was along the lines of that.) And then Noah just kind of went caput. We got absolutely no conclusion with him. Was he still a ghost? Did he finally travel on into the after life? Why was he suddenly having issues keeping up his normal facade now? Also, Mr. Gray just went caput too. In fact, that whole scene with him "becoming a king" and wanting to change the magic-dealing business was never wrapped up. What happened after the creepy triplet killed Piper and the demon was feeding from her? I'm assuming Mr. Gray got away. Did he end up going back with Maura or going off on his own? WHY WAS THIS NOT RESOLVED, I LOVED MR. GRAY. ALSO, WHY THE FLACK DIDNT BLUE AND GANSEY KISS IN THE EPIGLOGUE. I THINK THE FANDOM DESERVED A NON-DEADLY KISS, STIEFVATER. Alright, I think that's it. Even though I felt strongly about some of this stuff, I still LOVED this conclusion. The first half of the story, like the toga party and The Orphan Girl, were heart-shatteringly adorable. I could scarcely breathe whenever Gansey and Blue openly held hands or hugged each other.